Earth Walker, Paul Coleman, has traveled through 39 nations over the past 18 years to spread environmental and peace messages, as well as to encourage others to preserve our beautiful Earth. As a result of his incredible inspiration and enthusiasm, over 11 million trees have been planted around the world! It all goes back to a cycle tour of Iceland in 1988, when Paul had a vision of humanity at a crossroads. He saw two worlds: one a dark world full of pain and despair, the other a beautiful one where all was possible, and immediately made a decision. Paul started out on his first major walk from Canada to South America to draw attention to the destruction of the world's forests and to attend the first United Nations Earth Summit in Brazil in 1992. He began a ten-year walking mission in 2000, planting trees wherever he goes. 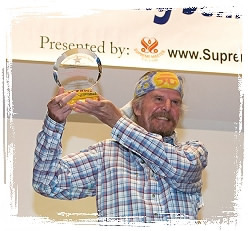 He received the Hearts of Humanity Award in 2004 and represented the Earth as one of the Earth Lovers at EXPO 2005 held in Aichi, Japan. On June 7, Golden Year 5 (2008), in recognition of his exemplary contribution to a sustainable future for humanity, Paul Coleman was honored with the Shining World Protection Award presented by our Hong Kong Association members on behalf of Supreme Master Ching Hai. 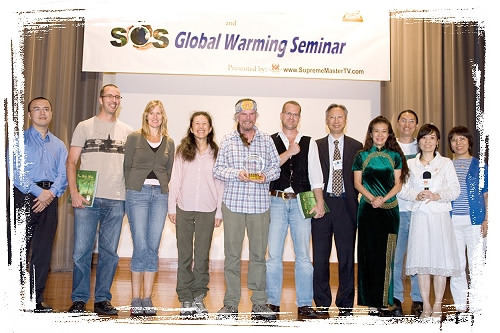 The Award ceremony was all the more special and significant because it took place at Hong Kong's first-ever global warming seminar entitled "Go Veggie, Be Green, and Save the Planet" held by fellow initiates at Mongkok Community Hall, where government environmental officials, green groups, corporations, educational institutions and the media were invited to join hands to stop global warming. Paul joyfully accepted the Award as well as some of Master's books, such as The Noble Wilds, and DVDs. He expressed his deep appreciation for the recognition and said that this encouragement would greatly empower him to continue his work for humanity. The audience was not only honored to have such a special guest present at this event, but was also enthralled by his fascinating adventures. We thank Paul for delivering a sense of hope that we too can play a small part in sustaining the magnificence of our home planet. As he said, "It all depends on what we do ... If each one of us does something good to the Earth, the future will be very good."